We’re pleased to publish the story, written byBill Horner VK4FW for all MDXC members. Far and fascinating islands where everything is difficult… expecially when in the Team there is a very special and “invisible” guest: his name is “Murphy”. 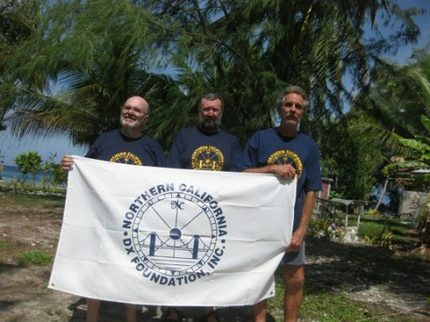 T2T TuvaluDXpedition has been proudly supported byMDXC. 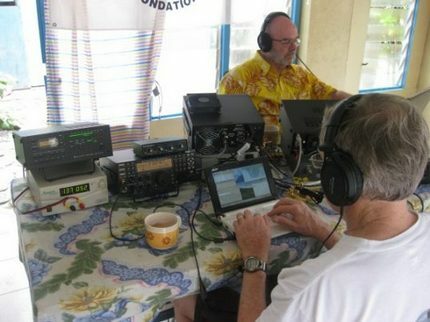 Another occasion to underline our friendship with Pacific DXers, a gorup of very active and excellent DXers. See you for the next DXpedition! We looked long and hard around the Pacific area and at one stage we were going to T33 until we found a couple of EU operators had big plans for that. If there is one thing I absolutely detest its when someone tries to beat another announced operation… it is one of the most childish irresponsible things anyone can do and whilst they had planned to have small stop overs at other places including Tuvalu we finally chose T2 because we felt it was the only resort we had other than T33. Immediately we started trying to make sure of airline flights and freight. We got a license pretty smartly and everything fell into place with ease. We even booked and paid for in advance 100kg of extra luggage so that we could accommodate an extra rig and amplifier as well as antennae. With some 200kgs of equipment between Eddie VK4ANand myself we met at the airport where we had to report to customs to ensure we could get all our equipment back into the country when we returned (yes they inspected it all including serial numbers). With that all done it was now time to actually check in at the airport desk. The flight to Nadi was without incident where we were met by Rocky 3D2DD. After picking up some more equipment that was already stored at his home we then went to our villa some 40minutes away called Seashell@Momi. We had specifically booked this establishment because of the incredible location and facility. We had chosen “bure 8” as it is at one end of the establishment which meant minimal pedestrian traffic. Situated right on the beach we had both of my home brew 30m and 40m verticals and they worked a treat ( that was after I got rid of murphy ).The 5 band spiderbeam was at 10m above ground with the dx88 vertical erected approx. 12m from the waters’ edge. The first qso was with HA9SU on 30m cw. 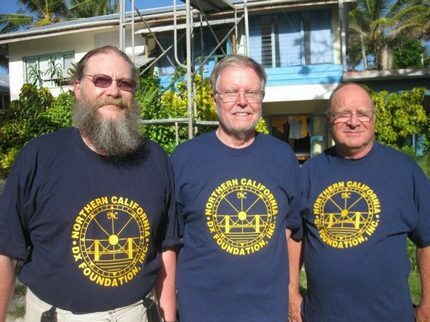 When the American operators arrived they bought with them the Dx Engineering 80m vertical and a hexbeam as well as a second Elecraft K3 and KPA 500 amplifier. Openings on 10m and 12m surprised the life out of us and reminded me of years gone by with the excitement levels reaching fever pitch on many an occasion. With Fiji nowhere to be seen on the wanted list, pile ups were absolutely enormous especially from brilliant openings into both EU and AF. Originally we had planned to operate multi single in the CQWW contest with 3D2Aand use 3D2T outside the contest. When contest time came Eddie VK4AN fired up on 10m and managed to work hundreds in no time flat and after a few hours he was still going hard at it with great success. We made an on the spot decision for him to just do single op single band and he did not let us down. 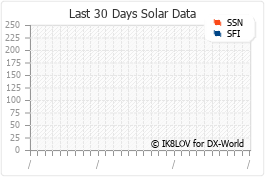 He managed over 2800 qsos running low power… What a buzz. All the while I was busy as possible handing out 3D2T qsos mainly on CW (my favourite mode). Then along came murphy again… all of a sudden the spiderbeam went AWOL. We pulled it all down thinking the balun had died . For those of you that have never seen a 5 band spiderbeam you are in for a treat… looks like a big “hills cloths hoist”. After checking the balun, making a change and re-erecting it still no joy, bring it down again all the while the temperature is close to 40degree celius and humidity is 80plus %… after some 2 hours I suddenly notice that 2 wire elements are inter twined which was simply unbelievable that neither of us picked up on this sooner. It was apparent that a bird had crashed into the antenna… a quick resurrect and hey presto back to the pile ups. Then Eric VK4NEF arrived and went to work mainly on SSB. I think he is still reeling from shock at the size of the pile ups. When the Americans arrived they spent a little chasing pile ups before we had to disassemble and pack. The Elecraft K3 and KPA 500 matching amplifier worked a treat and was an absolute pleasure to use. Just a few days before however murphy struck again. We had been given the bad news that due to major problems at Tuvalu we would not be able to take any excess luggage despite having booked and paying for 100 kgs in advance. Eddie VK4AN , Rocky 3D2DD and myself spent all day scouring Fiji to find a way to get all our equipment to Tuvalu. We even tried to charter a private yacht to take it there for us. Sadly we were unable to convince any authorities to take even a single extra bag or box. 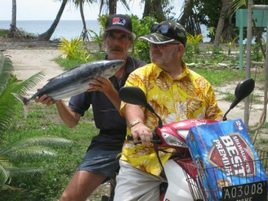 This meant that a lot of equipment would be left behind in Nadi and our qso total at Tuvalu was going to suffer badly. During the next day we all went through every piece of equipment and personal belongings as we began to work out exactly what we had to take and how small we could all be with cloth. We weighed bags many times as we adjusted again and again until we were all as content as possible under pretty harrowing circumstances. There is simply nothing like having your bags packed and repacked with various bits and pieces not to mention other operators cloth etc. Finally we had everything as best we could make it in preparation for the flight from Suva to Tuvalu. The next morning we made our way by motor vehicle from Nadi to Suva before finally getting to check in at the airport enroute to Tuvalu. Our flight from Suva to Funafuti was pretty smooth despite some inclement weather… We all joked that maybe we should have bought the umbrella despite the fact that Tuvalu had no real rain for some 3 years and was in a terrible state of water shortage. On arrival at Tuvalu it was raining and kept doing so for 3 days dumping a massive 17 inches of rain. It seemed we had bought the people a change of luck, however we still had Murphy with us… firstly our motel staff failed to meet us at the airport and could not be found for over an hour… finally we were transported to the motel/lodge that we had pre-booked only to find that somehow they had double booked it and we did not have sufficient rooms for us to stay. Imagine our shock as we started to think about what else was available on an incredibly small Pacific atoll which is as run down as you can just about get. Thankfully after much looking and consultation we finally found a place that at least could somewhat cater for all of us as well as permit amateur radio. Our final operating place would be “The Hideaway Lodge”. By this time of the day it was fast getting dark. We managed to get the 40m vertical erected. Our first qso usingT2T was N6ML on 40m cw. An hour or so later the 30m vertical was erected and our second station started with WL7E the first logged on 30m cw. The first night of operating despite everyone being extremely tired went very well. At daylight the next morning we managed to get the dx88 vertical up. Needless to say we had to make arrangements to find a way to get a decent pole to mount the spiderbeam on as we were forced to leave all our masts in Fiji. 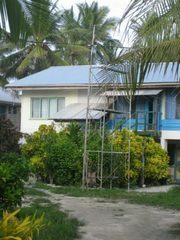 The 80m and 160m antenna was eventually erected as high as possible in 3 coconut trees. A full sized 160m dipole only just fits across the island… we had crashing wave ocean on one side of the lodge with the other side being what the locals term as lagoon side. Finally during more rain we managed to get it erected on some building scaffolding which we rented from a local builder… It did the trick and we were now able to try to concentrate on getting qsos in the log. Over the next few days we endured some rather uncomfortable weather which made operating hell… bloody Murphy yet again… then to top all that off some of us started to feel rather poorly with a couple of us ending up at the hospital. I can honestly say that what we had I would not wish on my worst enemy. Even after I finally arrived back home I was again at the doctors and getting more medications until I finally got better. 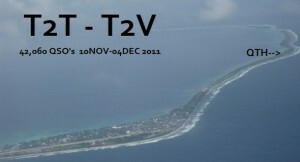 Whilst at Tuvalu the team members also got stuck into the CQWW CW contest usingT2V. It was tough work trying to break some of the pile ups down as well as chasing the elusive multiplier. One of the big mistakes we made was to give out zone 32 when in fact it should have been zone 31. We immediately contacted the contest committee who agreed to allow for not only our log to count but also for every ones qso to count in their respective contest totals. We would certainly like to thank them for their wisdom on this whole matter. Tuvalu is one of the tiniest island countries in the world and there are a dozen or so islands that make up the actual country with a population of some 6000 odd. The country relies very heavily on foreign aid as there is basically no industry other than fishing available for them to make money. Some of the note able countries that help is South Korea, Taiwan, Japan and Australia. The Tuvalu government actually have foreign fishing boats under contract and all the unsaleable by products from them is donated to the people. Many of the men are away for long periods of time sometimes up to 6 months at a time working for various shipping companies. Shops are very small and have various items all be it that most of them are basic. 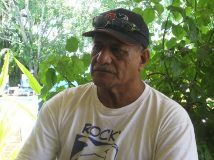 Everyday facilities are primitive at best with Tuvaluvians certainly struggling with day to day living.Currency in Tuvalu is Australian dollars and they have their own bank which is able to cash travellers cheques. There are absolutely no eftpos/credit card facilities available. They have their own landline phone system as well as a mobile cell system. Internet is there all be it at a dial up style speed so there is outside communications available. The national food dish for Tuvalu is rice with either chicken or pork. There are literally hundreds of pigs scattered in various stys all over the island. Most of the other food stuffs come by supply ship from Fiji or New Zealand. As previously mention Tuvalu has been in major drought with drinking water being ferried daily by ships as well as emergency aircraft. The ironic thing is that we were there for 25 days and only seen 4 days of fine sunny weather. All tanks are full except for the huge amount of new ones that had just arrived as a donation from Australia… And who knows maybe by now they will all be in use. We had the second amp fail. We simply could do no more with the amps so they were both packed up ready to leave. We continued to fight hard trying to get more and more qsos logged running with just 100 watts. Since returning home and having all the equipment sent back to Elecraft I am pleased to say that all of it is fixed and in perfect working order… a simple thing to do when you have access to the right equipment. Would I take Elecraft equipment again… absolutely yes. Whilst I am not a technician I will simply say this… In all my years of dxpeditioning I have never found a better combination, I have never found another radio/amplifier that will permit the use of 2 stations simultaneously on the same band at the same time with absolutely nil inter mod interference of any kind … yes we actually had the 2 stations on CW and RTTY (sometimes only 50khz apart) or RTTY and SSB or CW and SSB on the same band at the same time both working fine with a maximum of 2 feet of rig/amp separation and antennae separated by less than 150 feet. We had passband filters with us but rarely did we even notice when they were not in line and they got packed away early in the operation. By the time this article is printed I will have the 2 sets of the Elecraft k3 and kpa500 units back here and ready for departure to Nauru. Over the next few days of the operation we knew that it was near impossible to work 160m however we tried. Again the one thing that we did notice was the endless openings on 10m and 12m. Whilst not the same as Fiji the openings did exist. The one thing that cost us heaps was the fact we had to leave a third complete station in Fiji along with many of our extra antennae. We know that some of you are disappointed with our final result and I can assure you all that no one is more disappointed than our team. Our final qso tallies can be found at www.3d2t.pacific-dxers.com and www.t2t.pacific-dxers.com One of the other challenges for us was to have a crack at the 60m band. We had some openings and whilst none of the operators had any experience on this band it became evident that it has a tendancy to behave like 80m and 160m … some days are better than others. Most of the openings we got on this band were to USA. Of course there are those of you who think that you understand how the 6m band works. Various days we noticed Pacific Stations getting openings yet our only 6m qso was with FK8CP… It was like Murphy had thrown a blanket over us. And all too soon it was time to start dismantling and packing everything up. We had managed to almost get all things done we set out to do despite all the problems thrown at us and so it began. The flight from Funafuti to Suva was to be on a beautiful 57 year old Convair 580 aircraft. 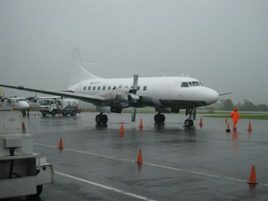 We had all seen this aircraft sitting on the tarmac at Suva when we had boarded our ATR42 aircraft to come to Tuvalu. Time to go… All aboard… you know the drill. As we taxied done the runway I looked about thinking that I may never get back here again and then we were off. As we all began to settle back into the flight we were all feeling a little uneasy as the air cooled cabin suddenly was not so cool. We would have only been in the air maybe 9 or 10 minutes when suddenly huge amounts of oil began escaping the right hand side engine compartment. I was sitting right there looking at it with Jay K4ZLE just in front of me. We both alerted the air hostess who informed the captain. 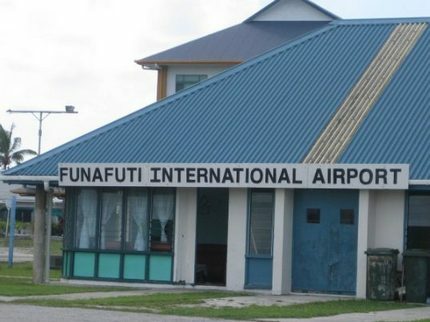 As we did an about face and made for an emergency landing back at Funafuti I could not help but to think that good old Murphy was at it again. The Tuvalu Police who are also the Fire Brigade have extremely limited knowledge or training for any emergency let alone a possible major fire or worse an ocean crash of an aircraft. When we got back to safe land we all disembarked whilst they did their level best to fix the plane. What had decided to go AWOL was the compressor seal. As this was unable to be fixed we finally after some 2 hours, again took off for Suva for one of the most uncomfortable flights we have ever endured. No cabin coolness and no cabin pressurization… damn Murphy to hell. When we finally landed in Suva our connecting flight to Nadi had long departed so the airline bought in an extra plane to get us back and finally into our overnight accommodation at 11.30pm local. We were all way more than miserable and tired but somehow managed to see the funny side of it all after being scared half to death. In summing up, on behalf of the team I would like to thank all of sponsors especially Elecraft, DX Engineering, ATRC, QRZ DX, NCDXF, DDXG, MDXC, SEDXC, SWODXA, HDXCC, LDXG, ODXG, GDXF, PDX AND VK4FWPRINT. As well, a special thank you to all of the individuals who made this possible and a very special thanks to Max IK8LOV who supplied his brilliant online log software. VK4AN, VK4FW and VK4NEF 73 to all, cu from the next one.